We at Correia Fishing Co pride ourselves on providing the highest quality seafood to our customers and with our retail outlet conveniently located in Fishing Boat Harbour in Fremantle we can provide you with export quality seafood at home! “Correia Brand” wild caught seafood is available, direct to the public, from our premises, located on the Fremantle Fishing Boat Harbour, 2 Mews Rd, Fremantle. All our produce is sorted, cleaned, graded, packed and snap frozen at sea, guaranteeing freshness and flavour. Products available include tiger prawns, king prawns, coral prawns, squid, cuttlefish, crabs, whiting, and more. Our raw & cooked prawns are available in either in 3kg or 10kg cartons depending on stock levels. 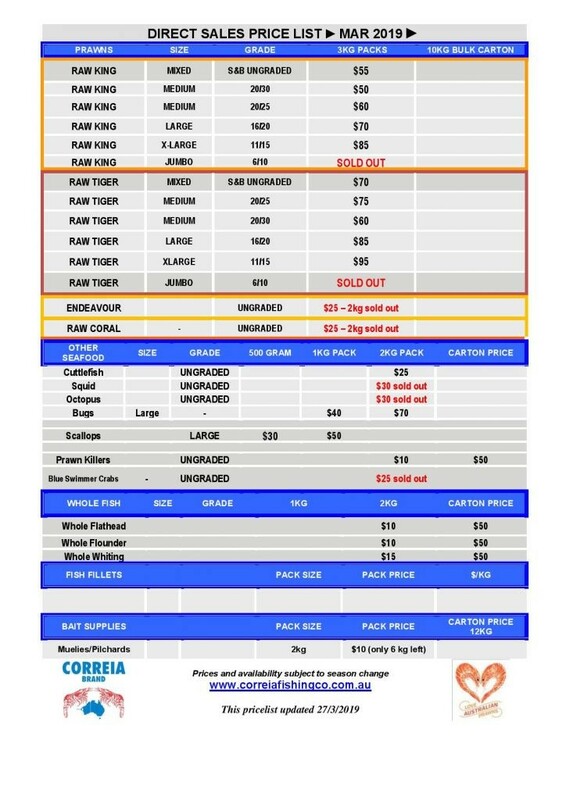 Please see our current pricelist or click on the link to view a printable version.